Auto manufacturers have attempted to replicate German automotive design for years, and it’s not hard to understand why. With their elegant styling, timeless design and legendary performance pedigree German classics like the Mercedes-Benz 300SL Gullwing and BMW E30 M3 have withstood the test of time. On Feb. 9, Hyundai unveiled the all-new Hyundai Genesis 5.0 R-Type at the Chicago Auto Show. The new variant of the Genesis features all of the attributes of many German luxury sedans. The R-Spec is powered by a 5.0-liter V8, producing a very impressive 429 horsepower. That’s more than the Mercedes-Benz E550 and BMW 550i. The car also features an 8-speed “Shiftronic” automatic transmission. The styling and design of the new R-Spec takes many features from its competition. The taillights look nearly identical to the those on the 2012 Mercedes-Benz CLS-class. Even the optional added safety features take from its peers, such as the Lane Departure Warning System and the LED daytime headlights, a new addition to 2012 CLS-class. Hyundai Genesis R-Spec - Courtesy of Hyundai U.S.A. The new Hyundai Genesis R-Spec might look good on the outside, but judgment will have to be reserved until it gets put up to the real test. If the R-Spec can hold its own against its top-of-the-line competition and prove it’s a serious contender, then it might be able to distinguish itself. It will also have to convince prospective customers to purchase a Hyundai instead of a BMW or Mercedes-Benz. If there’s one thing that can be taken from the debut of the Hyundai Genesis R-Spec it’s this: German and Japanese manufacturers aren’t the only ones who are taking aim at the luxury sedan market any more. The Genesis R-Spec proves a Korean company, whose vehicles were once though of as inexpensive and poorly made, have gotten better, much better. The Hyundai Genesis R-Spec might not have the pedigree or history of the competition, but it doesn’t seem to matter. Hyundai seems determined to take a piece of the pie and is trying harder than ever to cement their brand with the automotive elite. 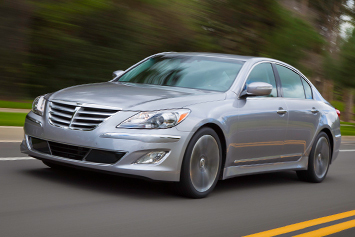 The Hyundai Genesis R-Spec will go on sale in the U.S. in the summer 2011.